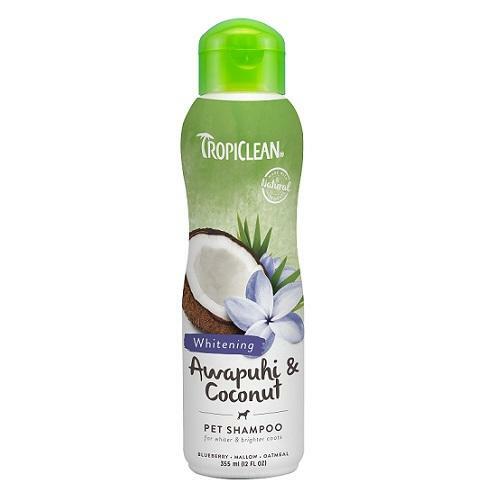 TropiClean Awapuhi & Coconut Pet Shampoo takes your pet"_s coat to whiter and brighter heights. In a rich lather, oatmeal prevents dry skin while awapuhi and blueberry naturally enhance all colors. Our unique whitening formula gently cleans and conditions while making your pet"_s coat brilliantly beautiful. Natural protein highlights all colors naturally, so it works well on tricolor coats, too. Great for dogs and cats of all ages. Best when used along with TropiClean Pet Conditioner for a coat that"_s soft, bright, and oh-so-fresh.